Our local town, is a medieval town of great character designated a 'Petite cité de caractère' and Floral Town. It boasts a famous Chateau, 11th Century Church and 17th Century housing, all in a riverside setting on a hill. There is a good selection of bars, restaurants, pavement cafes and artist shops, and a bustling Saturday street market. 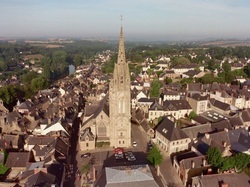 ​We think it is one of the best small towns in Brittany. Josselin is located in the Morbihan Region of Brittany in North West France. 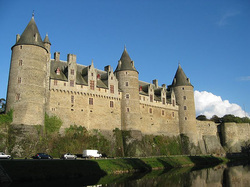 Josselin castle has overlooked this town since the Middle Ages, and has witnessed some fierce battles over the years. 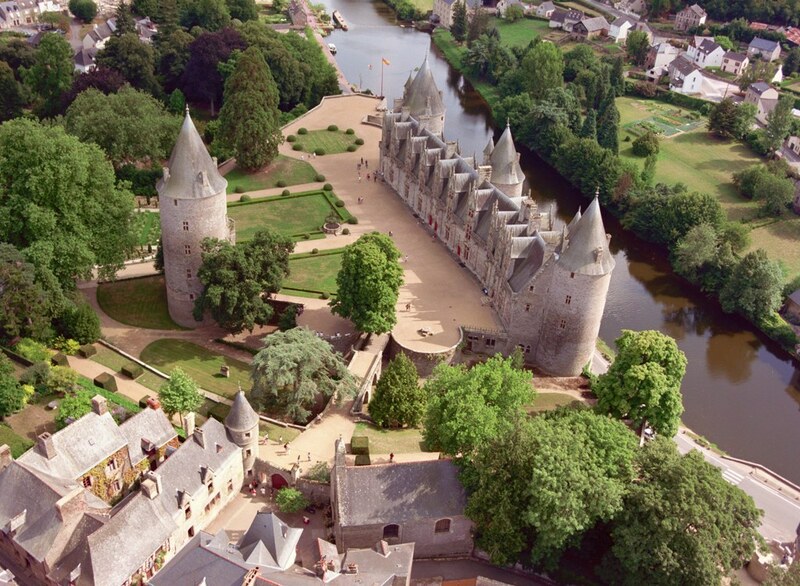 Josselin is a small town, perfect for a day's visit, with medieval half-timbered houses clustered around the stunning château at its centre. 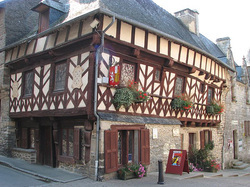 Josselin is an exceptionally attractive historic town, and is very popular with the British (hence the English Bookshop!). These days, you're almost as likely to hear an English voice around town as you are a French one, but Brittany's history has always been bound up with the British Isles. Britons first came here in the 5th and 6th centuries, when large numbers crossed the sea from their homelands in Wales, Cornwall and Ireland to settle here. Not that relations have always been cordial - in 1351 thirty Breton knights rode out from the castle to do battle with thirty English & allied knights from nearby Ploermel garrison. They met half way between Josselin and Ploermel, and when eight of the English knights were killed, the rest were taken for ransom sealing a French victory on this occasion! This is now known as the famous Battle of the Thirty. 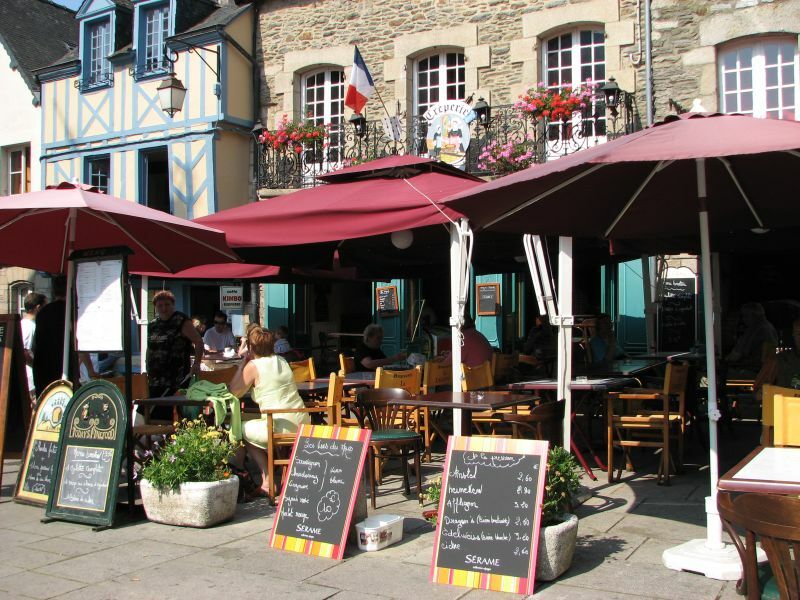 For a small town, Josselin has a surprisingly wide variety of places to eat. That's another reason why we like it here - there is enough choice to eat out each evening at a different restaurant, if that's what you like. You will find a choice of five crêperies, four pizzerias and ten restaurants/brasseries, with menus catering for all tastes and pockets, starting at just 8€ a head for the set menu and rising to 47€ at the grand Hotel Restaurant Du Chateau, which sits majestically on the banks of the Oust opposite the Chateau. In addition there are several bars to choose from, most offering pavement seating during the summer season. A highly recommended restaurant offering top quality French cuisine is La Table D'O, previous winners of the Best Restaurant in Brittany award from Brittany Ferries - they have magnificent views of the chateau and river (menus from 20-42€). One diner who ate here rated it as the best meal they have ever had. Click for our Google interactive map of recommended places to eat, giving the location, a photo and a brief review of each. Out of season many of the restaurants will operate on reduced hours and reduced days, and they will take their holidays. The local population is very small and they do rely heavily on tourist visitors to make a living. 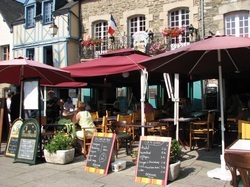 TripAdvisor now has a good range of reviews on the places to eat in Josselin. The three majestic towers of the château du Josselin overlook the river Oust and dominate the town of Josselin. It is widely considered to be one of the most impressive chateaux in Brittany. Originally built in the early 11th century, it was completely destroyed by King Henry II of England. The building of a replacement started in 1173, but parts of that have undergone some changes over the centuries. In the 17th and 18th centuries, the castle became derelict and it was only in 1835 that the Duke of Rohan undertook its restoration. The castle is one of just a few still owned by the old ruling families. The castle can only be visited by guided tour of the ground floor rooms, as the Rohan's still live in the rest of the castle. You get to see the dining room, the antechamber, drawing room, antechamber and Library with tours available in French or English. You can wander through and explore the grounds for as long as you wish, and the view from the castle ramparts is breath-taking, but not recommended for those nervous of heights! The castle provides three distinct views depending on your perspective. Viewed from the road bridge over the canal you get the fortified castle built on rock; from the canal path near the weir you see the fairy-tale castle, and viewed from the church tower you see the internal flamboyant gothic facade. Various events are held within the chateau throughout the year, including a flower show in April, a Medieval Festival in August, and a 'Meet Us' weekend in June when you can stroll through the gardens with the Duke! The Musee de Poupees (Dolls Museum) is located in the old stables within the castle grounds, and contains a collection of over 400 dolls collected over many generations of Rohans (separate entry or combined tickets available). The oldest dolls date back to the 17th century. Tours in English 11am & 2:30pm in July & Aug, 2:30pm only in Sept. Walking along its streets, you will be charmed by this medieval town with its architectural heritage. Half-timbered houses with coloured panels and corbels sit side by side with large 18th century free-stone town houses in grey and green schist or pale granite. Walking guides for town are available from the Tourist Information office (Open all year, hours vary according to season). You can walk a self-guided trail following the forty plaques fixed to historic or notable buildings and locations. Alternatively, you can go on a guided tour if your French is up to it (July & August Tues & Thrs at 15:30hrs. 2.5 euros adults/children under 12 yrs free). 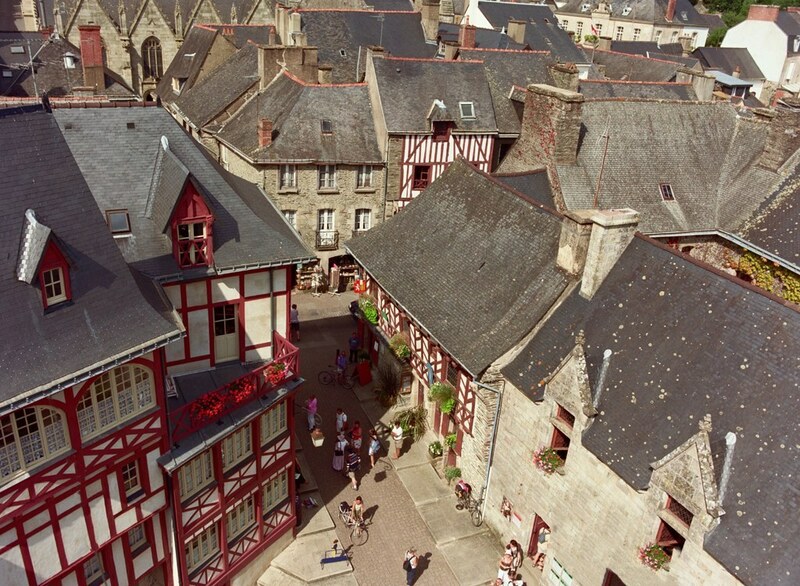 Josselin is a market town where you will find small specialist shops and large modern supermarkets, petrol station, post office, hospital, doctors, chemists, leisure centre, a cinema, cultural centre, a library and sports stadium and athletics field. Bike hire is available, and a 18-hole golf course on the banks of the River Oust. The market is held each Saturday morning and is a lively occasion taking over all the central streets of the town. The market is where many of the locals shop for their weekend produce, and you are likely to find the best quality fresh and local produce. You can buy anything from cheese to chickens. Well worth a visit, and we recommend you stop for lunch at one of the pavement cafes - just don't leave it too late because come the magic hour of 12 noon the siren on the Town Hall roof sounds (it's very loud! ), everyone packs up and heads for lunch, so most cafes and restaurants fill up quickly. Handbags and hats, arts and crafts, wood carvings, wooden toys, fresh fruit and vegetables, cheese, bread, olives onions and garlic, shellfish, fresh fish, fresh roast chicken and roast potatoes, meat, shoes, clothing, fresh made galettes and crepes, live chickens and ducks, plants, jewellry, cider, organic farm yogurt and cottage cheese, Oysters, kitchen ware, ironmongery, stews and hot food to take-away... etc! 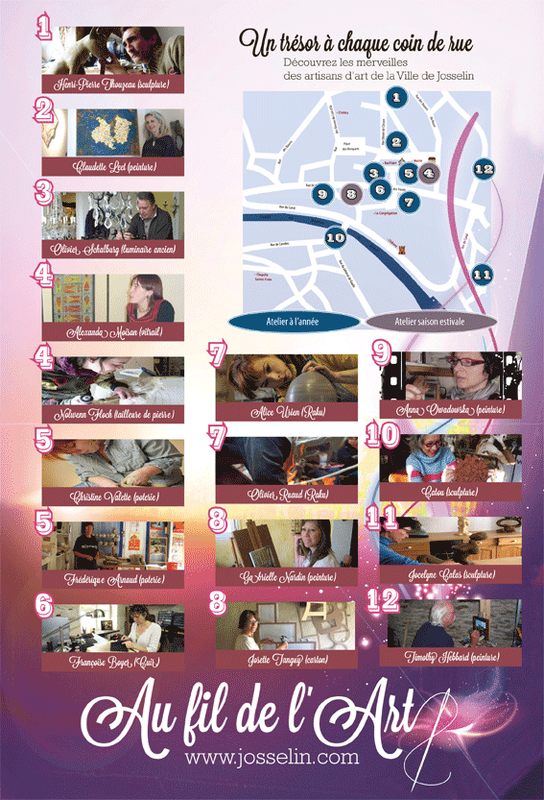 There are many cultural activities throughout the year. During July and August the Festiv'été hold free weekly open air music concerts staged outside the Marie (Town Hall) each Wednesday evening. We had some very enjoyable evenings watching and listening to all sorts of styles and types of music, including some great local Breton bands. 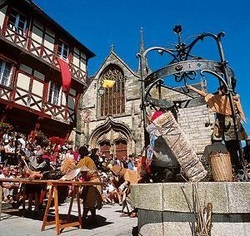 Also in July is the annual Medieval Festival, where locals wear traditional medieval costume with dancing, music and activities. On the 14th July the town is taken over by the Basille Day celebrations - again there is music, dancing, and a spectacular fireworks display set to music against the back-drop of the chateau. The 7-8th September is the religious festival Pardon de Notre-Dame du Roncier to celebrate the origins of the church in Josselin. The church hosts a number of choral and music concerts throughout the year. 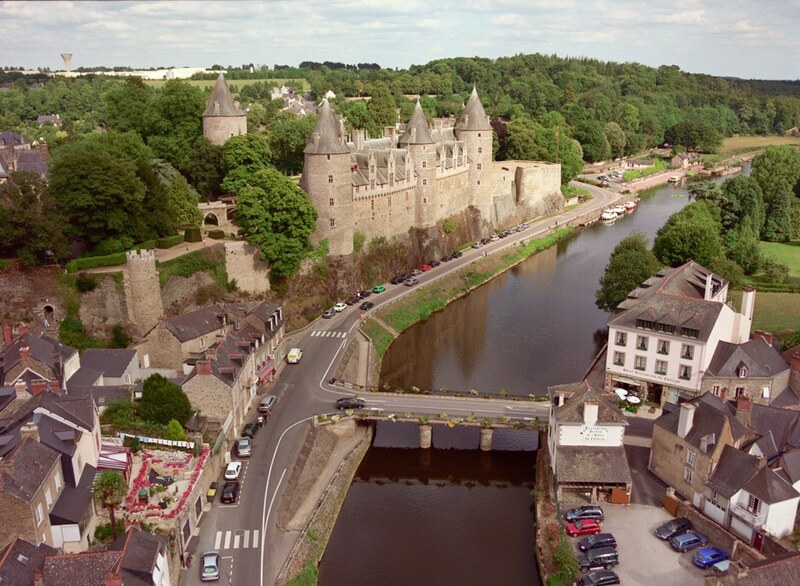 The canalised River Oust flows through Josselin from east to west and offers you the opportunity to take a boat ride or to walk or cycle along the canal path. A pleasant 15 minute stroll west along the towpath besides the Oust leads to the Ile de Beaufort, an island stretching between the river and the lock that allows canal boats to pass. This makes for a beautiful picnic spot, with grassy banks shaded by willow trees, or a good evening walk at dusk. In the summer months you can rent bikes and kayaks from the car park next to the canal. You can hire by the hour, day or week, and the canal path is a great traffic free route - ideal for younger children. The path is very well surfaced, and fairly flat, as you would expect alongside a canal! You can take a packed lunch and enjoy it at one of the picnic tables at halts along the route, or you can stop at a town or village for something to eat. We have enjoyed cycle rides in both directions. If you head east you can stop at Le Roc St Andre where there is a cafe and good boulangerie. Heading west the creperie at Les Forges is a good half way point, or if you are more energetic perhaps Rohan. 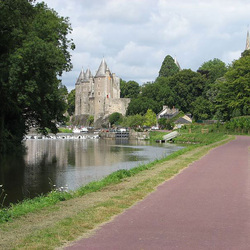 Here are photos from one of our Josselin canal path cycle rides. If you prefer a powered boat, Nico Nautic hire electric powered river boats in summer (10am-8pm) for 4 & 6 person boats with hiring from 30 min. to a full day, They can provide suggested circuits for 1, 3 and 7 hour trips. From 15 Euros for half an hour to 80 Euros for a half day. Tel 06 50 62 48 79. The pottery lizard and red squirrel that now feature on the external walls of our cottage came from potters from Josselin. The Bois d'Amour (Lovers Wood) is a small hidden park situated just on the outskirts of Josselin town and is a wonderful oasis of peace and calm. 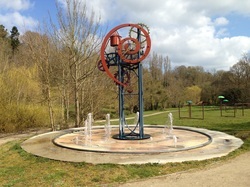 You can access it either from the top end of Josselin near the promenade, or from the car park next to Bar La Rotonde. It has been very well landscaped and contains wooded sections as well as a small lake. In recent years they have provided interpretive displays explaining the wildlife of the area in pictures and sounds. There are plenty of benches provided throughout the park as well as picnic tables and even a boules court. An amphitheatre stages open air films and concerts during the summer, and look out for the water powered clock. On visiting a busy Saturday market day, we like to take half an hour out to sit in the park with a wonderful pastry from one of the boulangeries and enjoy the calm before returning to finish our shopping. 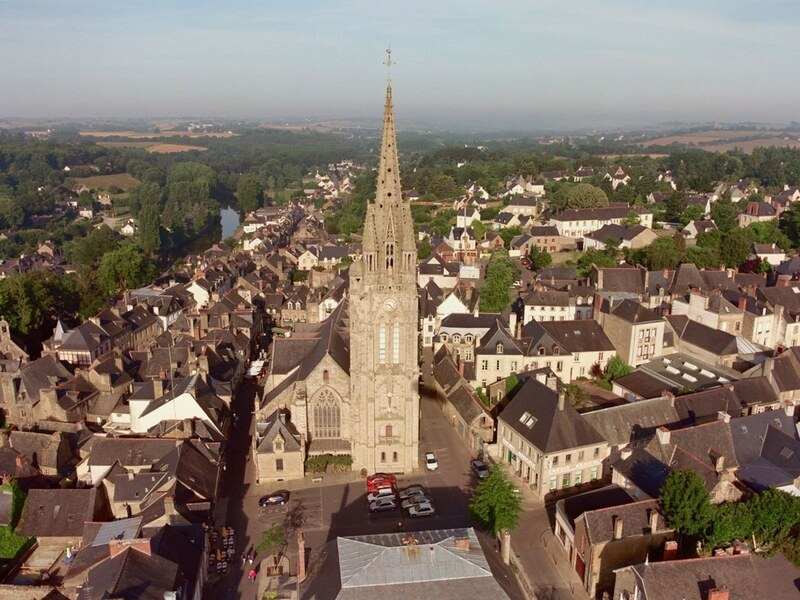 If you wander around the old medieval town with its half-timbered buildings, you'll soon come across the Notre Dame du Roncier which dominates the centre of Josselin. The church is built on the spot where, in the ninth century, a peasant is said to have found a statue of the Virgin under a bramble bush. The statue was burnt during the Revolution. The style of this church represents the flamboyant architecture of the 15th century, and parts date from the 12th century. The church is host to regular music concerts throughout the year. For the best view of the town and surrounding area, make your way to the church bell tower. During July & August, you can climb the bell tower free of charge to enjoy splendid views over the castle and river - don't forget to take your camera. Enter the bell tower from an external doorway facing the Town Hall. In the summer local students sit just inside the doorway and offer you an information board (English, French etc) and collect a voluntary tip from the visitors on their way out. If the tower door is locked you can ask for the key at the Marie. You get a wonderful 360 degree view, including the inside facade of the Château. Each August the annual horse races take place at the Hippodrome de St-jean-des-Pres. There are 7 courses involving flat racing and obstacles, the fun starts at 2pm and there is an entry fee. Look out for the posters advertising dates.